When I first transitioned from relaxed hair to natural hair in 2010. I watched every YouTube video and soon became a product junkie. I think pretty much all natural hair women can relate that at some point in their journey it was the same way for them. For some reason, I had a very hard time finding products that would lay my edges down and not leave any flakes or residue behind. I attended a natural hair event on a whim and as we were sharing various aspects of having natural hair. 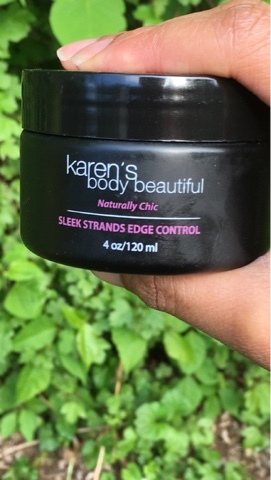 The host mentioned Karen's Body Beautiful Edge Control. It just so happened that she was raffling off some of the products and I won the edge control. Let's just say that this product is everything, when I say everything I mean everything. No matter what product I already have in my hair this edge control does not leave any residue or flakes on my hair. It lays my edges all the way down. What I love most about this product is that it like you never even added anything to your hair (no residue). Trust me, it's like magic. My natural hair siestas know what I mean. Some products I would have to wash out the same day. Not this product. Trust me. It's truly a best-kept secret and a most have.